BUFFALO, N.Y. -- The University at Buffalo women's basketball team received some great news late last week as the NCAA approved a waiver to allow Memphis transfer Finess Dickson to be immediately eligible for competition. Dickson will be a redshirt freshman this season for the Bulls after being granted a medical hardship waiver last season at Memphis. "Finess has been fighting for over a year to get on that basketball court again and she needed someone to fight with her," stated head coach Felisha Legette-Jack. "To have her come to Buffalo and believe in us enough for a chance to be eligible to play as a walk-on is extraordinary. She believes that we are the people that can help her grow into this game of life. I am humbled and thrilled to have her character, academics, basketball and belief join our Bulls family. We are blessed to have Finess join us." Dickson was granted legislative relief by the NCAA, through a legislative relief waiver, so instead of sitting out a full academic year for the Bulls after transferring, she will be immediately eligible to play. The University of Memphis was in full support of the waiver and worked with the Bulls to get the waiver approved by the NCAA. The speedy floor general comes to Buffalo after spending last season at Memphis where she appeared in four games before sustaining a season-ending injury. Prior to the injury, Dickson was averaging 6.0 minutes/game for the Tigers during her freshman campaign. Prior to joining the Tigers, Dickson was a three-star point guard recruit out of Homewood-Flossmoor high school where she helped lead her nationally-ranked team to the Class 4A Supersectionals in the state of Illinois. She earned multiple accolades following her senior season including Chicago Tribune All-State special mention and Second Team Daily Southtown All-Area after averaging 10.0 points, 5.0 assists and 5.0 steals. 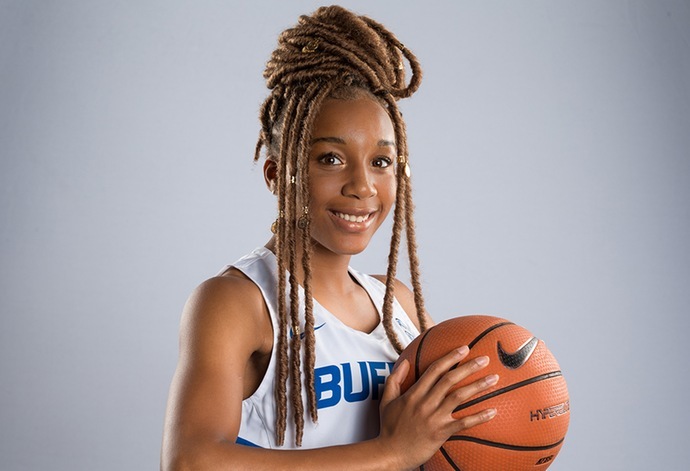 Dickson will be vying for playing time at the point for the Bulls after the graduation of all-time UB great Stephanie Reid. The Illinois native is one of seven newcomers to the Buffalo program that will be looking to make an immediate impact on a team that went to the Sweet 16 a season ago. Dickson and Buffalo will open up their 2018-19 campaign on Thursday, November 1 at home as they welcome the Bloomsburg Huskies for an exhibition game inside Alumni Arena at 7:00 pm.